2013 Subaru Forester. Click for larger photo. The Forester is a strong competitor in the compact SUV segment. It comes standard with Subaru's trademark symmetrical all-wheel drive and a 4-cylinder 2.5L horizontally opposed "Boxer" engine. Thanks to its upright shape, the Forester offers excellent visibility all-around and comfortable seating position. Tight turning circle (34.4 ft) makes the Forester easy to navigate in tight city corners. We have test drove the 2013 Forester and researched reliability, common problems, read owner reviews and checked Subaru technical service bulletins. Is Subaru Forester a good choice on the used car market? Let's find out. Interior: The first thing you notice inside the Forester is how great is the visibility. It's a concept lost on most modern SUVs. The up-right seating position, tall windows and large side mirrors offer excellent view of the road situation around. Overall, the interior is simple and practical. Rear seats fold almost flat, offering 68.3 cu. ft. of cargo capacity (in models without moonroof). Handling and ride Thanks to its flat "boxer" engine, the Forester offers lower center of gravity than most compact SUVs. This results in better stability in turns and comfortable ride. Tight turning radius is another plus. To make a U-turn, the Forester needs just 34.4 feet. Both 2011 Honda CR-V and Toyota RAV4 need more than 37 feet. How good is the Forester in snow? We didn't have a chance to test drive this Forester in winter, but we did tested the previous 2008 Forester in a foot-deep snow. The car handled it easy. Given that the 2009-2013 Forester is not much different, we expect it to be as competent is winter. Here is a great Youtube video showing how the Forester can handle the snow. The ground clearance is listed at 8.7 inches for 2.5X models and 8.9 inches for the 2.5XT (turbo) model. Timing belt or Timing chain? The 2009 and 2010 Forester comes with the old-style EJ253 non-turbo SOHC engine. It has a timing belt that needs to be replaced every 105,000 miles. For 2011 model, the non-turbo engine has been replaced with the newer FB25B 2.5L DOHC engine that has a timing chain instead of a belt. The 2009-2013 Forester with a turbocharged EJ255 DOHC engine has a timing belt that also needs to be replaced at 105,000 miles. Fuel Economy: The 2013 2.5L non-turbo automatic Forester is rated at 21/26 mpg, which translates to 422 miles (679 km) to a tank with mostly highway driving. A turbocharged engine is thirsty and requires premium gasoline. Read also: Should you buy or avoid a turbocharged car? 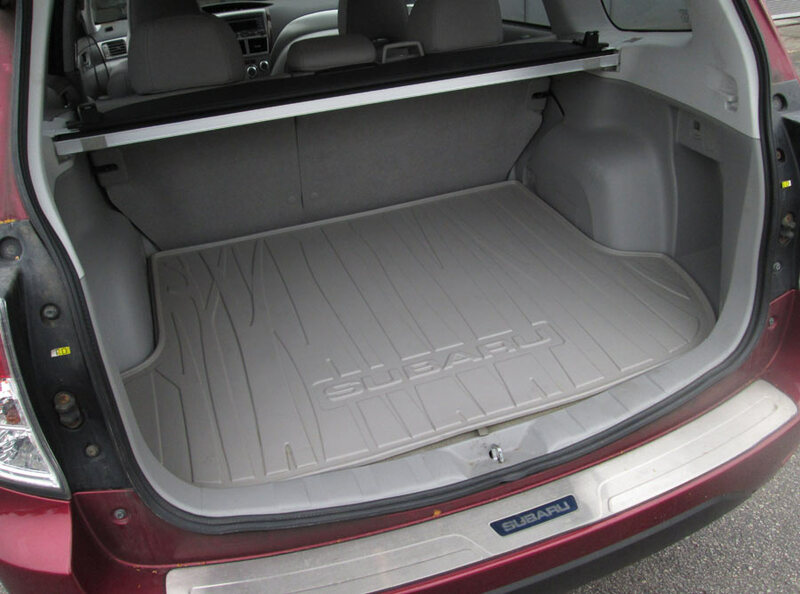 Towing capacity: For the 2012 Subaru Forester, the towing capacity is listed at "up to 2,400 lb. (200-lb. tongue weight)" on a trailer equipped with trailer brakes. You can find the more detailed information in your owner's manual under section 8 "Driving Tips". Safety: The NHTSA awarded the 2009 and 2010 Forester with five stars out of five for frontal and side crash protection and 4 stars for rollover resistance. Starting from 2011, the NHTSA introduced more rigorous testing. In the new tests, the 2011 early-release Forester got four stars overall rating, however side crash protection received only three stars. The 2011 later-release, 2012 and 2013 Forester got 4 stars overall, with four stars for frontal, side-crash protection and rollover resistance. 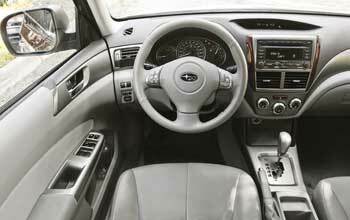 RELATED: Subaru Outback 2010-2014 review: reliability, common problems, maintenance and more. Cons: Engine and other problems in some model years (see the next page), rattles, audio system and interior materials could be better. Pros: Visibility, cargo space, ground clearance, capable all-wheel drive system, handling in bad weather, low center of gravity, decent towing capacity, ride quality, tight turning radius. Common problems: Rattling exhaust shields are common. The symptom is an occasional metal rattling noise that comes at certain engine rpms. The repair is not very expensive: a loose exhaust heat shield needs to be re-secured. Most repair shops use worm gear clamps for this purpose. A number of Forester owners have reported a failed catalytic converter. The symptom is the Check Engine light with the code P0420 or P0421. When out of warranty, the repair is expensive. The OEM converter may cost over $1,000 to replace, while the aftermarket catalytic converter may cost $350-$600 (for the part) plus $80-$200 labor. Several owners reported leaking head gaskets (2009, 2010 mostly at high mileage). With the introduction of a new non-turbo engine (FB25) in 2011 Forester, there are complaints about oil consumption in this motor. 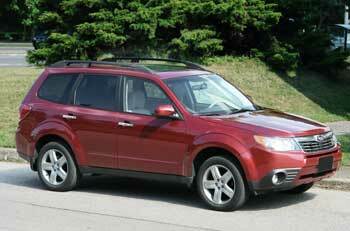 Consumer Reports also mentions engine problems in 2009 and 2011 Forester. The 2010 and 2013 Forester are rated above average for engine issues. Minor oil leaks are reported often too. Failed sway bar links and bushings are often mentioned. The repair is not very expensive. Brakes need to be serviced regularly in order to prevent sticking and premature wear. A/C problems are mentioned frequently. Many owners mention various trim rattles inside the car. Overall: We recommend looking a non-turbo Forester, as the turbo motor is thirsty, requires premium gasoline and sensitive to lack of maintenance. The 2010, 2012 and 2013 Forester have less reported problems than other years. Among the competitors, we would recommend Toyota RAV4 and Honda CR-V, as both are rated well for reliability. The 2013-plus Mazda CX-5 is better on gas and should also be considered as an alternative. What to look for when buying a used Subaru Forester: If you are buying from Subaru dealer, checking the service history may reveal many potential problems, such as oil consumption. Check if the A/C works. When started cold watch out for loud engine noises. During a test drive, watch out for jerking or rough shifting of the automatic transmission. A burnt oil smell under the hood may indicate oil leaks. The Check Engine light staying on must be investigated before buying a car, as some problems will be expensive to repair. We recommend having a used Subaru Forester inspected prior purchase by an independent mechanics familiar with Subaru or another Subaru dealer. Maintenance: According to the 2009-2010 Maintenance schedule, the engine oil needs to be changed every 7,500 miles for non-turbo models and every 3,750 miles for turbo models. A turbocharged engine is very sensitive to oil quality. Longer intervals between oil changes can lead to problems. If you notice the engine consumes oil between oil changes, check the oil level more frequently and top up as needed. Running the engine low on oil will cause problems. Read here: how to check the oil level. Spark plugs need to be changed every 30,000 miles for non-turbo models and every 60,000 for turbo models. A drive belt and timing belt need to be replaced every 105,000 miles. For 2011 Forester got a new 2.5L non-turbo DOHC engine. It doesn't have a timing belt. Its spark plugs need to be replaced every 60,000 miles. Subaru Technical Information System - you can buy a temporary subscription and get access to a factory service manual and technical service bulletins. It's a great help for DIY enthusiasts. Subaru of America Vehicle Resources - Access owner's manuals online, Starlink FAQ, BlueConnect guides and more. Check For Recalls NHTSA - check for recalls, safety ratings and search the complaint database.